Kevin Tway claims his first PGA Tour title in a playoff over Ryan Moore and Brandt Snedeker at Silverado. As Kevin Casey notes in this Golfweek roundup of notes and quotes, it was Tway’s steadiness that benefitted from Brandt Snedeker losing a five-stroke lead. Lucas Bjerregaard, who attended the Ryder Cup as a spectator, gets to do the Swilcan Burn trophy shot before figuring how to get that shipped home to Denmark. This is his second European Tour title. Kind of a Fred Astaire thing going, almost. Padraig ended up 5th in the KLM and is probably Europe’s best last-minute injury replacement player should the Vice Captaincy thing not work out. How about our good buddy and Scottish golf travel podcaster Ru Macdonald, “budding social media content creator” for the European Tour getting thrown into the Thunderdome for the European Tour’s “Beat The Pro” and makes very nice contact! Young Tom Morris made the first Open Championship ace 149 years ago this past weekend. That first tee and 18th “grandstand” at the Ryder Cup is garnering oohs and aahs on social media. Certainly golf has never seen something that…steep! Angela Stanford wins the Evian Championship for her first major. Seems like so long ago she was battling Hillary Lunke, Kelly Robbins and Annika for a U.S. Open at Pumpkin Ridge…because it was 2003. What a week, what a finish, what a win. Congratulations to our 2018 champion, Sangmoon Bae! Paul Broadhurst captured the Champions Tour’s Ally Challenge at Warwick Hills. Ashun Wu is the KLM Open’s winner, becoming the first Chinese-born player to win three European Tour titles. Defending national champion Oklahoma State won its first tournament of 2018 and Matthew Wolff took his second individual title at the Olympia Fields/Fighting Illini. While the Dell Technologies crowns a champion on Monday, Labor Day weekend's Sunday gave away mostly straightforward hardware. And yes, I'm lumping in Jeff Wilson's U.S. Senior Amateur win from a few days ago, because, why not? 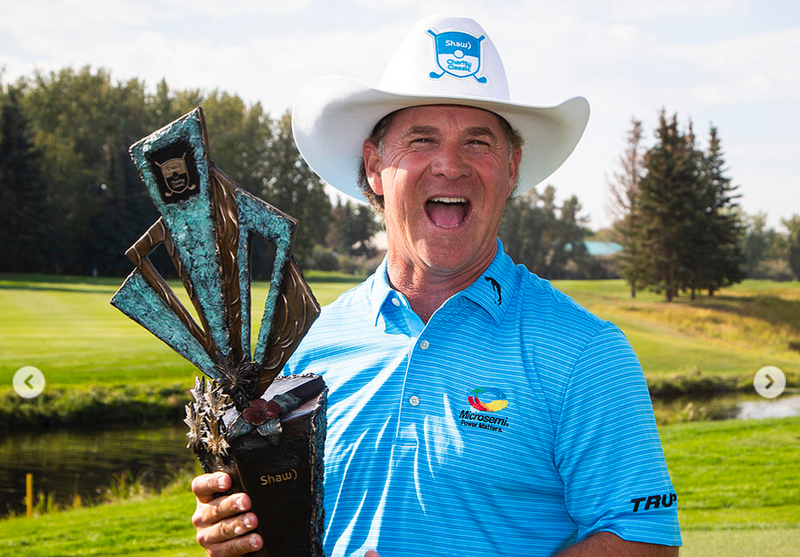 Scott McCarron earned both a hat he'll never wear again and a trophy he'll hide ASAP in winning the Shaw Classic. Kramer Hickok adds another breakthrough win for Texas men's golf in 2018, taking the Web.com Tour's DAP Championship. Nice work by Jeff Wilson in finally winning a USGA event by taking the U.S. Senior Amateur at Eugene Country Club last week. And finally, congrats to the American women at the World Amateur Team at Carlton House. All but one of Sunday's tournament winners takes home a piece of crystal for their efforts, starting with Bryson DeChambeau at the 2018 Northern Trust where he is turning this season into something very special in his young career, writes David Dusek for Golfweek. Scott Parel won the PGA Tour Champions Boeing Classic and with it a bomber's jacket, a crystal globe and the photographic evidence yet that all white belts must go. And Robert Streb kicked off the Web.com Tour playoffs with a win in the Nationwide Children's Charity Classic. Sweet, sweet victory. 🏆 With his triumph @nchcgolf, @kstatemgolf alum Robert Streb leads The Finals 25 and has the inside track on @theplayerschamp berth. What a commanding win for Justin Thomas in the final WGC Bridgestone at Firestone, and in front of his grandparents. The full Golfweek roundup. Kenny Perry claimed the 3M Championship, played at TPC Twin Cities that will become a PGA Tour stop in 2019. Cole Hammer won the Western Amateur with mom Allison on the bag. Great to see you can read a Len Ziehm game story on one of America's biggest amateur tournaments. Is there anything better than winning one of the most prestigious titles in amateur golf with your mom on the bag, @cole_hammer? Sepp Straka takes the Web.com Tour's KC Golf Classic and with it an inconveniently enormous crystal trophy. Even the master club throwers make mistakes sometimes, with Sergio Garcia committing the ultimate sin of throwing his club hard at the bag. A PGA Tour Champions slideshow captures the incredible array of weather changes and imagery from Sunday at the Old Course, where Miguel Angel Jimenez won the Senior Open. The weather finally turned more Scottish-like at Gullane Sunday. The Dodgers turned hallways at Suntrust Park into a putting green. Dustin Johnson wins what is expected to be the final RBC Canadian Open played at Glen Abbey Golf Club. Ariya Jutanagarn wins the Ladies Scottish Open at fast and firm Gullane. In his 285th start, Richard McEvoy takes the Porsche European and a trophy which, at first glance looks fairly hideous but is pretty cool up close. Miguel Angel Jimenez fought off an all-star cast of seniors and his balky blade to win an exciting Senior Open at the Home of Golf. The singer was spotted at Chicago Golf Club for day one of U.S. Senior Women's Open practice. Rickie Fowler teed up at North Berwick, finished just barely in bounds at 18 and is using a push cart as he prepares to defend his 2015 Scottish Open at nearby Gullane. After contending at the Greenbrier Classic, Harold Varner kept his word and cut mom and dad's lawn. The inspiration that is Tommy Morrissey continues to attack the game with vigor and nearly made an ace at Pinehurst's Cradle. Kevin Na won the Military Salute At The Greenbrier Classic and with it, the classiest, biggest plasticware or hookah I've ever seen. Russell Knox took the Dubai Duty Free Irish Open in a sudden death playoff and is magically Scottish again in a Ryder Cup year. Nelson Ledesma won the LECOM Health Challenge and with it the most attractive bulletin board in golf. A week can change a career. 🏆 @nelsonledesma entered the @lecomhealthchallenge without a #webtour top-10 on his resume. With a two-shot win @pknpkresort, he moves to 24th on the money list, his eye on the @pgatour. The USA men and women won the Palmer Cup at Evian, France where, for a change, it was not raining. Matt Kuchar, Tommy Fleetwood and Sergio Garcia at the Royal Box, Wimbledon 2018. Joshua Kelley with the ultimate don't-try-this-at-home trick shot. Open Championship host Carnoustie is looking plenty crispy less than two weeks from The Open's 2018 start. Not to be outdone, Gullane is plenty firm and fast, too. This scene at Ballyliffin, while not the normal links vibe with its pond, captures some of the beautiful scenes sent around the world. Eric Van Rooyen leads the Dubai Duty Free Irish Open by four, with Danny Willett and Lee Westwood lurking within range of long overdue top finishes. Host Rory McIlroy sits 13 back. Matt Ginella says developer Mike Keiser has tapped Bill Coore and Ben Crenshaw to remodel Tom Doak's mysterious Sheep Ranch course at Bandon, Oregon. It's a project previously suggested as a possible Gil Hanse redesign by Keiser. Weekend Instagram Wrap: Elway At The U.S. Senior Open, Spieth's At The Special Olympics, Crispy Carnoustie, Sand Greens Are Back! John Elway served as U.S. Senior Open honorary chairman and made his presence felt at The Broadmoor. The Spieth family is supporting their youngest Elie at the Special Olympics, with Christine Spieth posting several images of the family attending the big event this week in Seattle. There won't be any questions of rough-fertilizing this time around at Carnoustie. Nice and crispy is the turf forecast just two weeks out from The Open! Wednesday night’s final jeopardy question was a tap-in. Tag someone that always chokes on gimme putts/questions. Jack Nicklaus, who competed against, with and even learned from Phil Rodgers, says farewell to the short game wizard. Rodgers is remembered with this sensational obituary by the San Diego Union-Tribune's Tod Leonard. Tiger Woods benched his Scotty Cameron Newport 2 in favor of a TaylorMade TP Collection Ardmore 3 for Tuesday's practice round at TPC Potomac. More details here from Dan Kilbridge. Fred Couples and Davis Love are aging gracefully as they walk around The Broadmoor for this week's U.S. Senior Open. The Fried Egg offers an aerial view of Inverness, post tree-removal, bunker remodeling and overall effort to put as much Ross back into an American classic. Quite the championship test. Inverness has got its Ross soul back. A spectacular compilation of Hosung Choi's swings from last week's Korean Open, courtesy of Skratch. Hosung Choi in all of his glory. Justin Thomas is teeing it up in the French Open this week and already about 20 strokes up on Bubba Watson, who panned the place upon arrival. So Yeon Ryu was among the LPGA Tour players at the CVS Charity Classic, seen here with Rory McIlroy and his spring-fling putting coach Brad Faxon. The new 12th hole "bunkering" at Pine Valley looks just as ghastly from a vertical as it has in all other photos that have surfaced. Bubba Watson took home the Travelers Championship for his third win of 2018 and third Travelers (kind of small) trophy. 19-year-old Nasa Hataoka won the NW Arkansas Championship and with it came an unwieldy piece or crystal and a wieldy Rolex. @nasahataoka became the 5the @rolex first-time winner of the LPGA season with her win at the #nwachampionship! Scott McCarron won the American Family Insurance PGA Tour Champions tournament and when he returns can provide his dentist's waiting room with the accent piece it's always needed. Dream Achieved. Scott McCarron is your 2018 @amfamchampionship winner! Matt Wallace captured the European Tour's BMW International Open stark white minimalist --expect anything different?--trophy. Brady Schnell takes home the Wichita Open's nautical-theme propeller--actually he'll be shipping that weapon FedEx--and moves to 12th on the Web.com Tour money list. The PGA Tour account salutes the late Peter Thomson with several images from his career. Captain of the only International Team victory @PresidentsCup. Five-time Open Champion. Peter Thomson (1929-2018), you will be truly missed. Ryan Vermeer won the PGA Club Pro Championship at Fort Ord's Bayonet course. Justin and Kate Rose are part owners of Master Merion, who ran 12th in a field of 30 in Royal Ascot's Royal Hunt Cup. Cristie Kerr spotted this burrowing turtle while preparing for the Walmart NW Championship.